Refines the elevator pitch. Going through the exercise from a newbie perspective forces teams to think hard about their app’s value proposition. Products only have a short period of time—and limited real estate—to answer, “Why would I use this?”. Affects brand perception A person’s first impression sets the tone for their perception of an app’s brand. Impacts customer support Good out of the box experiences have been shown to reduce customer support costs. Similarly, good first time app experiences may reduce customer support emails and improve reviews in the app store. Improves odds that new users will become returning users With 26% of users deleting an app after first use, the first time use scenario is your only opportunity to give them a reason to return. Some mobile apps are rehashing mistakes that have already been recognized and overcome in other domains, so I’m covering 4 FTUE best practices that are especially important in the context of mobile apps. Letting people play early is critical on mobile because people use their devices for such short sessions. They need to have bite-sized activities they can jump into. Consider the path people may have taken by the time they crack open an app. They’ve gone from inspiration touch point (a friend’s recommendation, a blog post, an ad, the “Featured” app store list), to the app detail screen, to authentication, to download, perhaps even an OS modal or two. When people finally get in, they’re eager to start playing around. They had an opportunity to read all about the app on its detail page, if that’s what they were interested in doing, and we know that people don’t like reading the manual (here’s a great study on the subject). So the first time experience should focus on letting people interact with its value proposition. 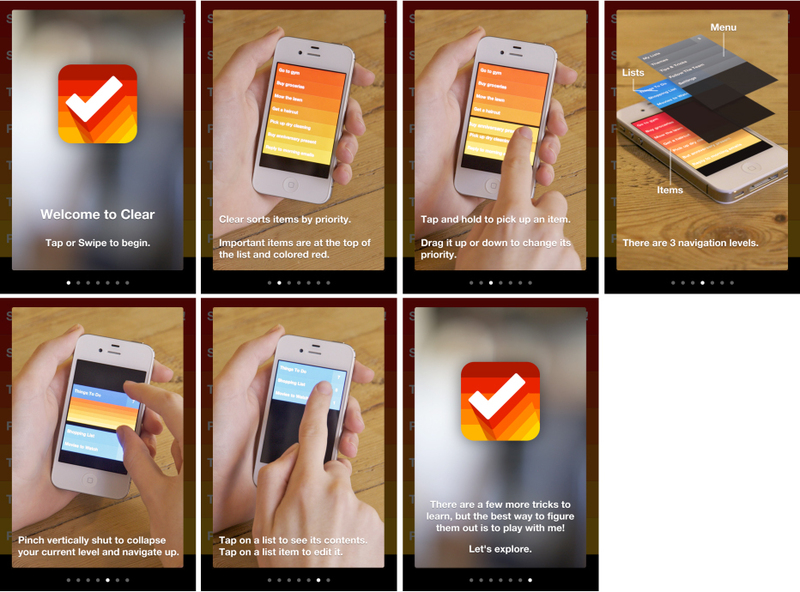 The Clear to-do app got a lot of press recently because of its gestural UI. 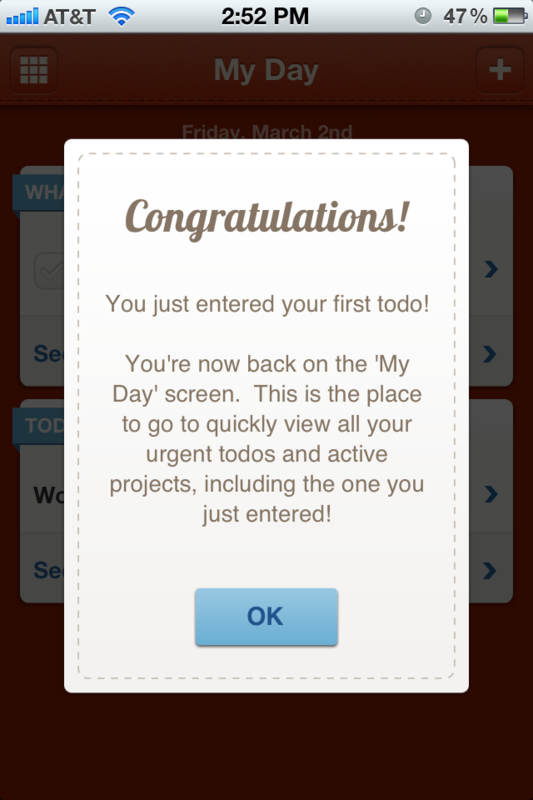 Many people downloaded the “breathtakingly simple todos” app eager to start moving things around. Unfortunately, the first thing users come across is a 7 screen introduction. There’s no way to skip this intro. 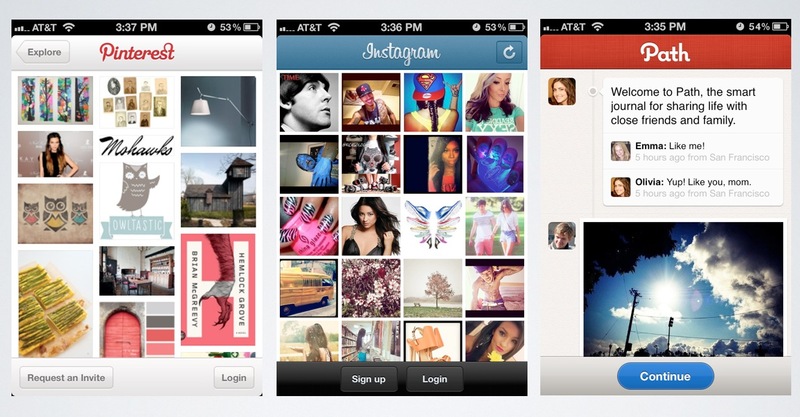 Users are forced to swipe through all cards before they can finally interact with the app. 2 of those 7 screens are simply bookends. A long intro like this encourages quick swiping to get to the end. Use them sparingly. If you need many, it’s time to reevaluate your interface. Limit content and communicate number of steps Stick to one thought/illustration per panel to make sure content is digestible. Use navigation marks or numbering to make it clear how many steps, or screens, are involved. Avoid using transition animations Don’t delay the user from moving forward by making them wait for animations between walkthrough panels. Make it available in help or settings If an introductory walkthrough includes important instructions or user preferences, make sure they can get back to it at any time. The help section is a great alternative location for extended walkthroughs, offloading them from the FTUE. Provide an escape hatch The Eatery app allows people to skip the tour* *warning: having a “skip tour” button may make people wonder why the tour was necessary in the first place. Engage the user early Try to incorporate some user interaction so that people feel like a part of the show. The Eatery does this with the “What do you eat?” checklist at the end of the intro. People like to try before they buy. But so many apps are forcing first time visitors to sign in or register before they can have a taste of what they’re signing up for. This throws a giant wall between people and the value proposition and it’s a usability mistake that’s already been called out by studies like Jared Spool’s “The $300 Million Button”. Square, a relatively new mobile payments app, starts with a “Get Started”/”Sign In” button pair. “Get started” sounds like it might allow some exploration, perhaps to browse a list of stores nearby that accept Square as a form of payment. Instead it takes users right into a registration flow that asks for personal and financial data to be shared with merchants. Yelp starts with a log in prompt. Tapping “No” seems like the fastest way to start reading reviews, but tapping it pops up a confirmation alert that needs to be dismissed. Finally, Netflix‘s first time experience doesn’t offer any way to get a glimpse of their title selection. In fact, it doesn’t even allow someone to sign up or get free trial access. These apps, and the many others that start with a sign-up prompt, are gambling that users have already bought into the value proposition and are willing to continue past these walls. A better approach for apps that do require some level of account access is to let people play with sample content. Free samples are ways to convince people why it’s worthwhile to register for an account. IntroNow requires users to have an account to participate in TV show discussions, share with friends, or set up a personal schedule. But the most novel feature of the app, the ability to recognize a show on TV by listening to it, is how it attracts many users. The app designers make sure this feature is available to first-time users via the “Try it Now” button. Work hard to provide as much content as possible without requiring sign up. Even returning users may not have time to sign in. A good first time user experience also needs to make sure that people who pass through it have a clear sense of what to do, or where to go, next. The first version of the photosharing app Color got negative reviews because of its unclear first time user experience (read one of the best app store reviews here). It prompted for some user interaction to start–asking for a name, then a photo–but when those tasks were completed, there were no clear next steps. Users ended up on a screen warning “Don’t use Color alone” and other content sections were empty. It was not pointed out that the app was fairly useless if you weren’t within 150 ft of someone else using the app. 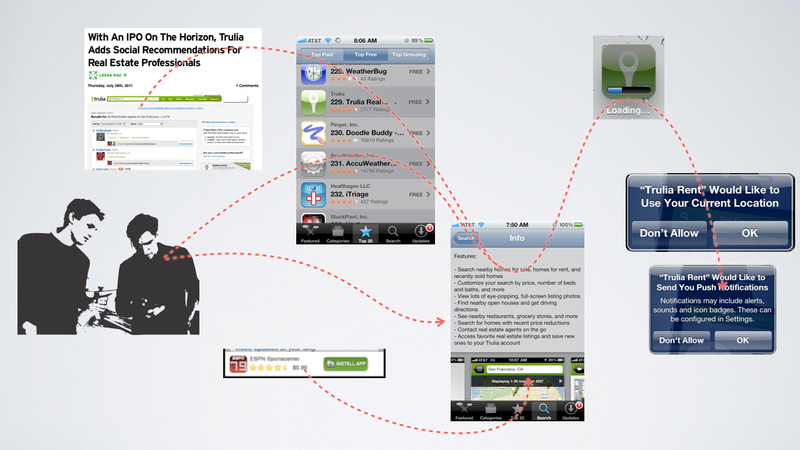 Ultimately, an app’s first time experience and next steps should flow together as part of the same story. 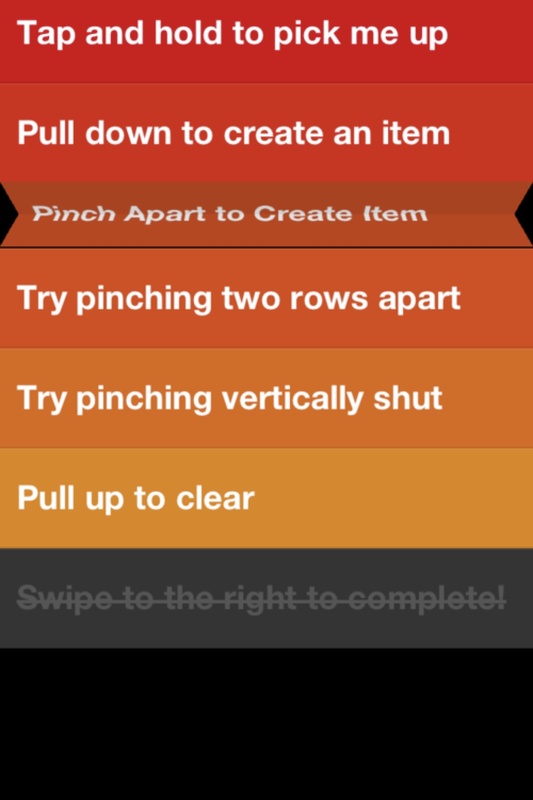 The Weave app explicitly calls out its next steps via the “Congratulations” screen that appears after the first task is created. 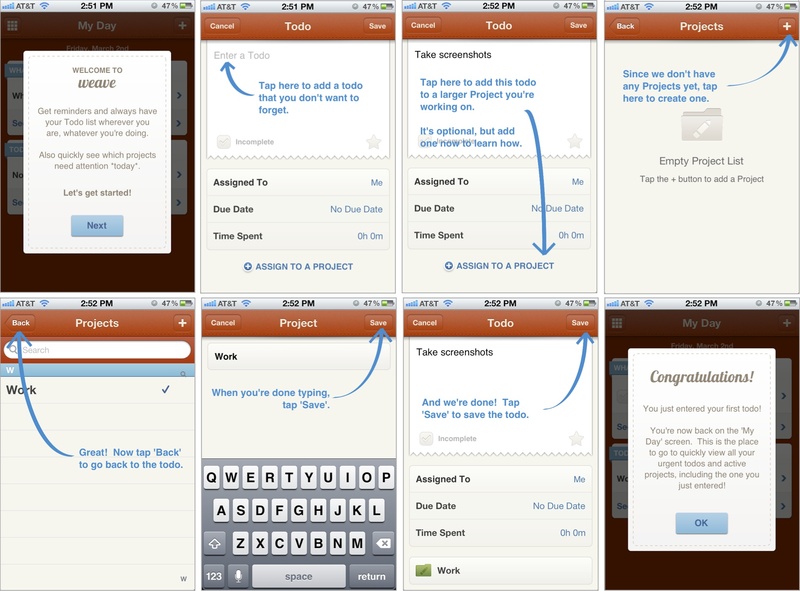 After that is dismissed, it logically delivers people to the task list view. The Eatery app flows users from the end of the introductory tour to the next most prominent activity of the app—taking a photo of their meal. When they “Snap their food”, they’re invited to rate it, then rate other food photos. Finally, first time user experiences should be focused. An app shouldn’t try to surface every nook and cranny of its features as part of its FTUE. Instead, apps should selectively showcase the key feature(s) and let people discover secondary and tertiary features over time. 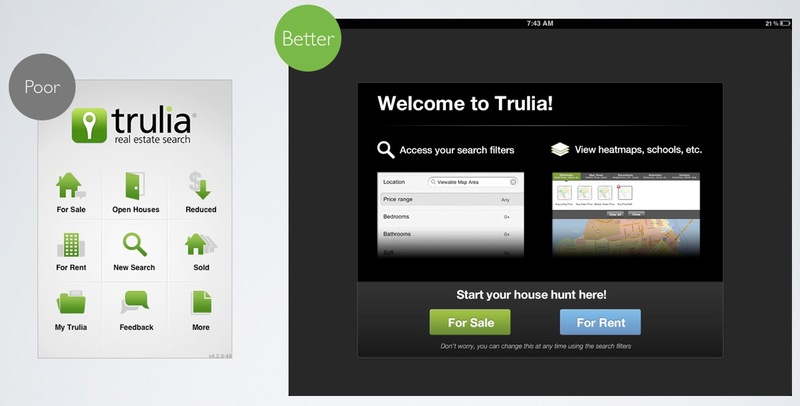 Trulia’s mobile app displays an icon springboard as its first time experience. There’s no prioritization here, no way for the first time user to understand where they should start or where the meat of the app is. Concepts such as “My Trulia” aren’t even going to be useful to the first timer. By contrast, Trulia’s iPad app has a much more successful FTUE, with a single launch screen inviting people to find properties for sale or rent. This makes the app’s key features much clearer and more actionable. 1. Show Interact, don’t tell. Teach people with contextual interactions. Don’t impede the user with modal instructions. Avoid long walkthroughs. If you have one, allow users to skip, keep content to one thought per panel, mark how many steps are involved, and avoid transition animations that delay. Allow users to re-access any contextual help (such as coach marks) or walkthrough info in Help. Don’t force people to log in or register to experience content or features. Make it clear where users can sign in or register once they’ve explored the app’s content. Sample content should be compelling and relevant to the key value proposition(s). When users complete the first time experience, make sure they are taken to a logical place in the app. Provide any relevant next-step instructions. Show people the most important, key feature(s) of the app. Encourage exploration to uncover secondary or tertiary features. Finding this article could not have come at a better time. A really great resource on a less talked about subject. Thanks!